Preheat oven at grill. Slice your sweet potato in toast-like pieces, approximately 1/2 cm thick. Combine truffle oil and honey thoroughly and use 1/2 the mixture to rub al sweet potato slices. Toast all slices in a toaster until cooked and toasty brown – you’ll probably need to toast twice. Crush the almonds and combine with the rest of the honey/truffle mixture. Put all slices on a baking sheet covered with baking parchment. 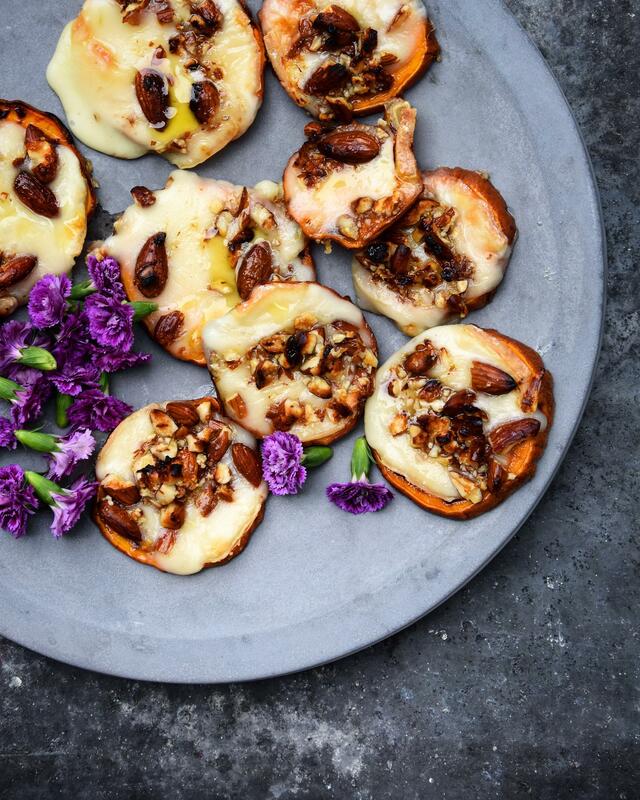 Slice the cheese and put on top of the sweet potato ‘toast’ + add the almond mixture. Put in the oven and grill until the cheese is lightly browned and melted – approximately 5 minutes. Sprinkle some extra truffle oil on top – to taste – and serve with edible flowers! That hits the target dead cetnre! Great answer! FoodDeco is a love story between food and decoration. FoodDeco is a website with taste, quite literally. Recipes, home deco inspiration, (online) shopping, table setting-and gift inspiration et cetera. A different taste to home deco. FOOD DECO only declares itself as the owner of the pictures of food, but not of the pictures of home deco.